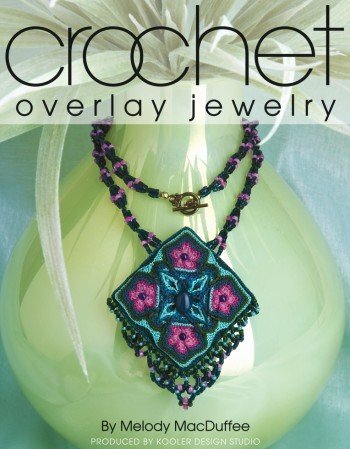 Crochet one-of-a-kind bracelets, necklaces, earrings, and more using all-purpose thread and a small crochet hook. Layer upon layer, color upon color, create intricate designs reminiscent of the symmetry of mandalas and mosaics, or the infinite patterns of the kaleidoscope. Start with simple crochet stitches and then gradually overlay with long complex stitches and clusters of stitches to achieve a vibrant, textured fabric. Team up with beads for jewelry that's stunning. 10 projects by Melody MacDuffee: Cameo, Beginning Amulet Bag, Rose & Taupe Neckpiece, Crazy Lace Amulet Bag, Peach Agate Bracelet, Kaleidoscope Necklace, Intermediate Amulet Bag, Floral Garden Bracelet, Garnet Earrings, and Floral Diamond Necklace. Cabtopia -- Lapidary Jewelry Design Template Stencil "Morphed"